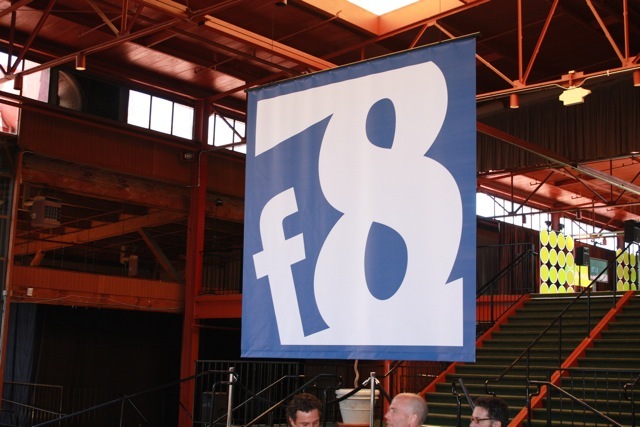 The TechCrunch team is on site at the Facebook Developer conference, and we’ll be live blogging the news. 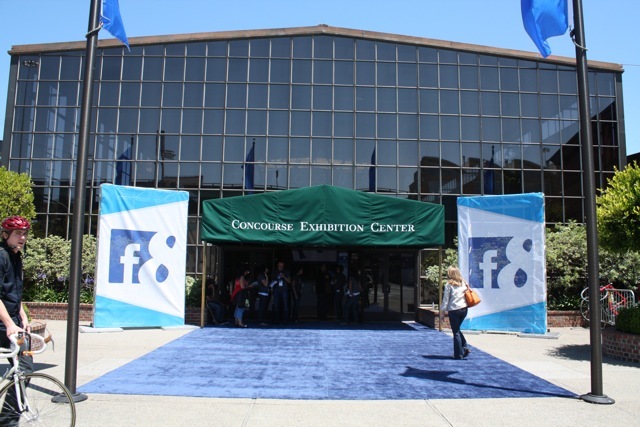 Mark Zuckerberg’s Keynote starts at 1:30 pm PST. Facebook’s press release is here. 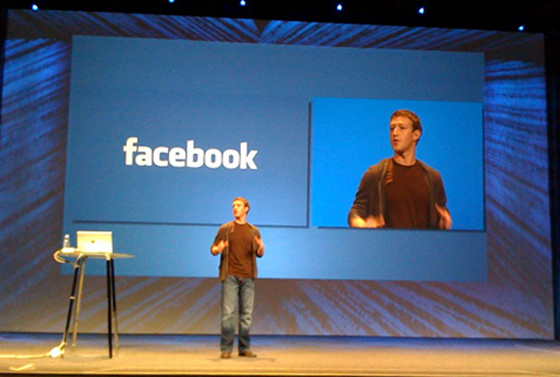 In a press briefing after the keynote, Zuckerberg stated “I wish I knew” when asked when the anticipated payments system would launch. 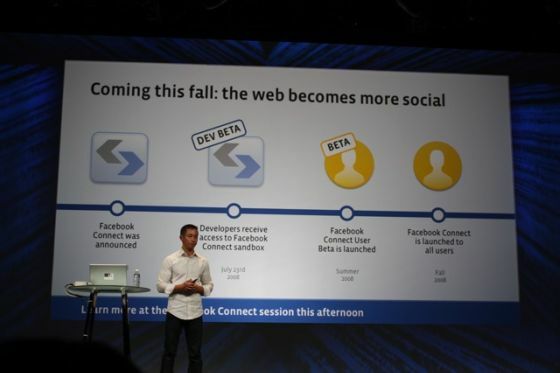 He also hinted that Facebook is working on launching improved search, but they aren’t close to launching it yet. 2:49 PM: That’s it. The show is over. 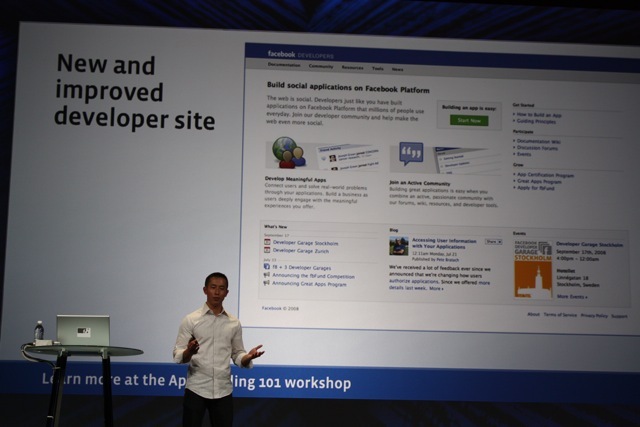 2:48 PM: Great Apps can integrate with users just like native Facebook apps, and they get early access to features. The Great Apps program is in alpha stage and the first two partners are iLike and Causes. There will be a strong enforcement system with all apps, and they will disable apps that are a problem. Over the last year they’ve disabled apps for violation of privacy or other policies. They take this very seriously, he says. 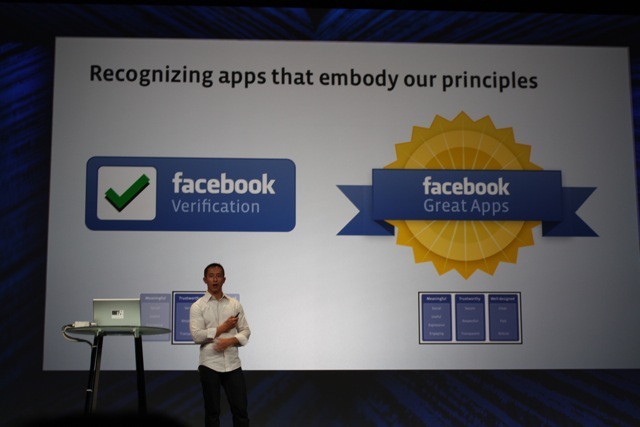 2:47 PM: The second announcement is the Facebook Great Apps Program (Top Tier program). 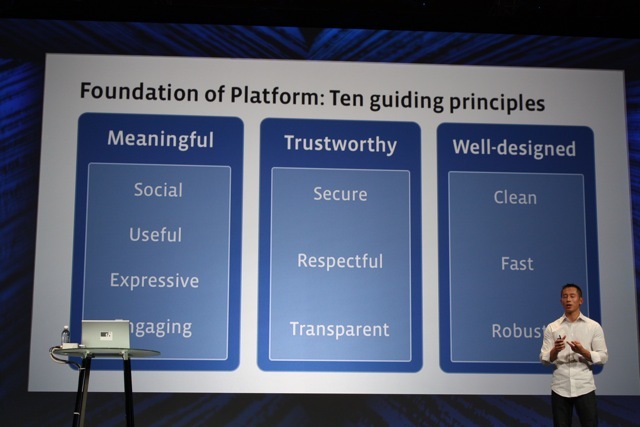 They embody all ten of the guiding principles, and they advance the mission of Facebook. 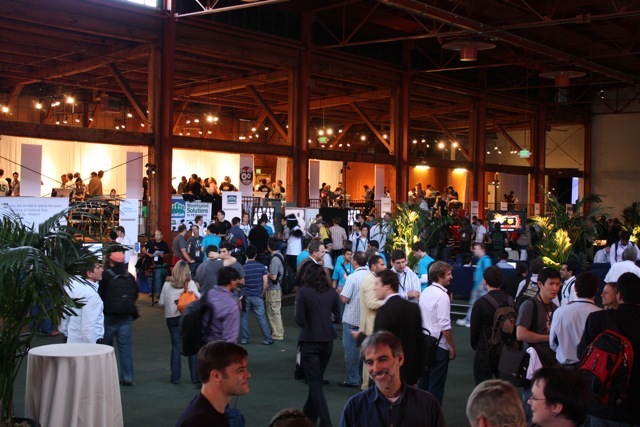 2:44 PM: They have partnerships with partners to help developer (Microsoft), host and scale. They are launching a new developer website that gives all the information needed for a quick start. He says 1000 apps have been submitted to the Facebook fund. They are revealing the names of fbFund’s recipients to date: Challenge, ConnectedWeddings, Podclass, MyListo, Trazzler, Zimride, LuckyCal, Coursefeed, Hotberry, and J2Play. They are announcing a new competition today. $2M will be given out over the next two months. 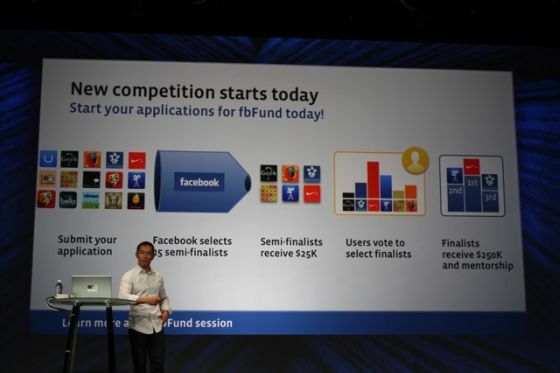 Facebook will select 25 finalists who will each get 25k. Users will vote on finalists who will each get 250k. 2:43 PM: He says they must keep the ecosystem safe for users and fair for developers. A year ago equal distribution became overwhelming to users, then they made restrictive changes that hurt apps. Going forward they will have different rules. They are announcing several programs to help app developers. Get Started Quickly tools like adding easy FBML tags. 2:37 PM: He says apps must be useful. The carpool app is great example, which lets users find carpool buddies. “Apps must also be expressive”- The graffiti app that lets users draw on friends profiles, is a good example. Finally, meaningful apps must be engaging. He says Playfish makes games that are highly engaging. Facebook users have played over 900 million minutes of Playfish games. That’s about 1800 years. 2:35 PM: Benjamin is announcing “guiding principles for great applications” which are based on dialog with community. It’s based on three pillars: meaningful, trustworthy and well designed. 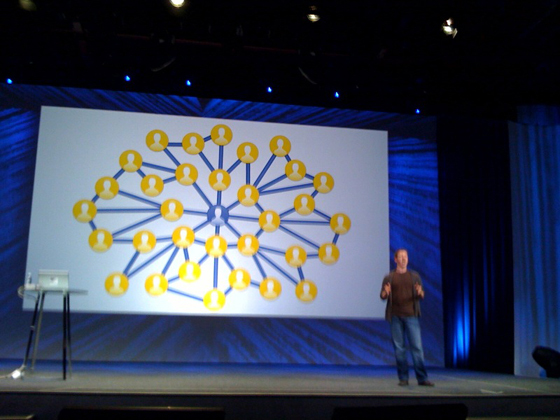 The best apps make use of the social graph. Applications must be social. A good example is the Lil Green Patch app, which helps users fight global warming by interacting with other users. 2:32 PM: Mark wraps things up, that appears to be the end of the announcements. 2:31 PM: Zuckerberg asked all Facebook employees who work on platform to stand up, then asked all app developers to stand up. 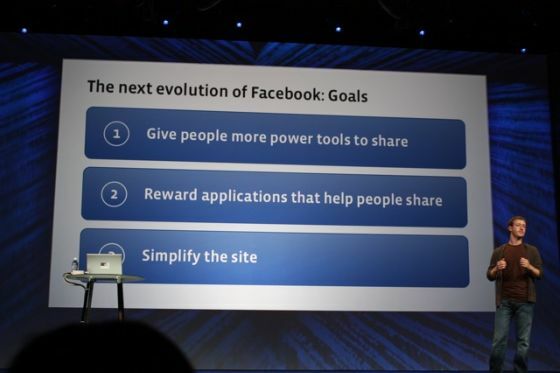 2:28 PM: To recap, he’s talked about new profiles and the highlighting of the news feed, the second item is Facebook Connect. The new profile launched Monday, he says. 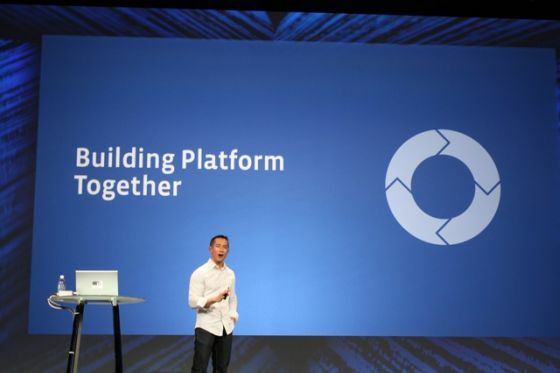 Facebook Connect will launch developer keys starting today – there will be a beta period. 2:26 PM: That’s it for launch partners. Mark is back on stage. 2:25 PM: A new site will have a “my friends” tab that shows reviews by friends in various cities. 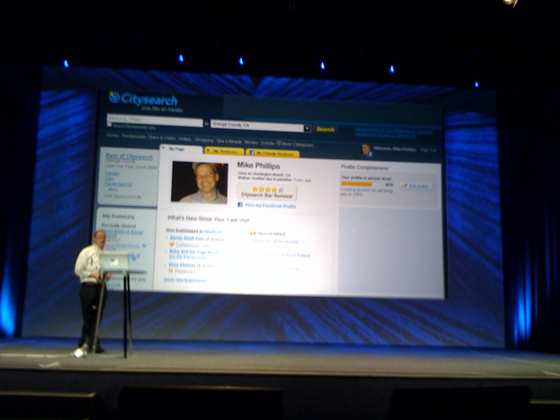 2:23 PM: Mike Philips from Citysearch is taking the stage. 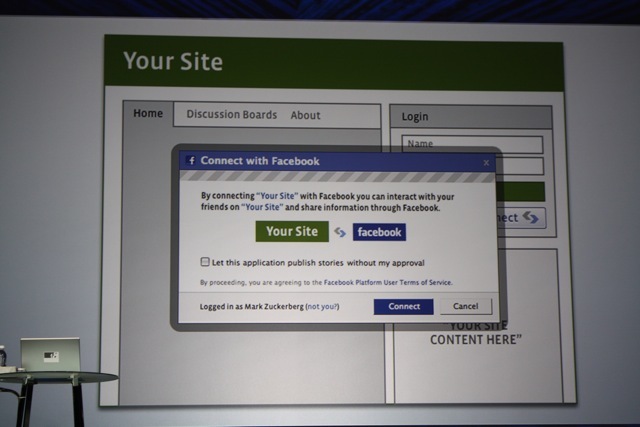 He says they are launching a new site, where sharing information is a big piece. They are integrating with Facebook Connect. When a user looks for a hotel, restaurant, etc., Citysearch already has lots of reviews and data, but not a way to link up reviews from friends. 2:22 PM: When you login to comment, users can sign in via Movable Type or Facebook. 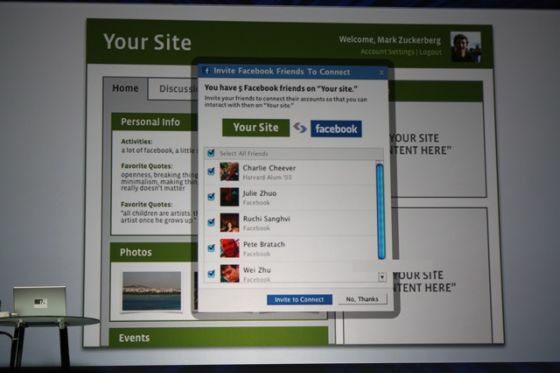 If you sign in with Facebook, it will display changes – light blue boxes outline your friend’s comments. 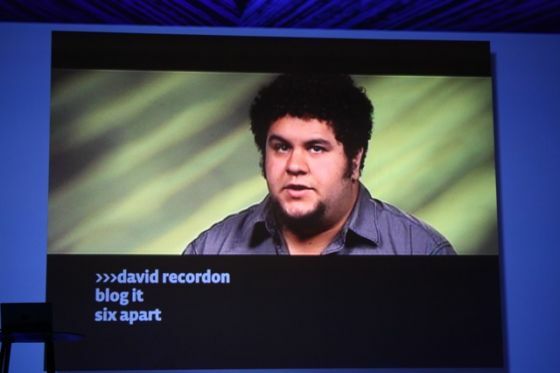 2:20 PM: David Recordon from Six Apart just took the stage. 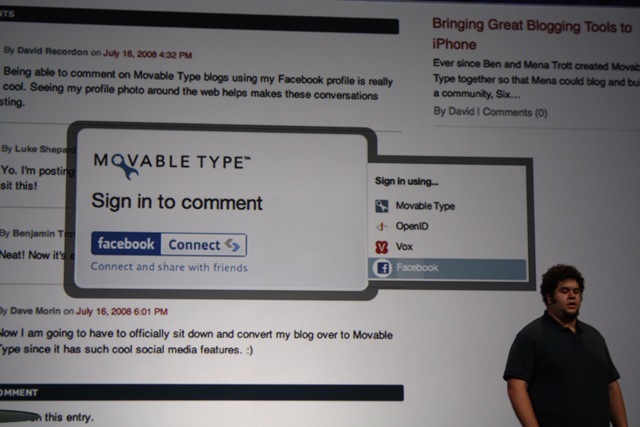 They are releasing a plugin for Movable Type that allows people to comment using their Facebook profiles. Users can decide to profiles or keep them private. 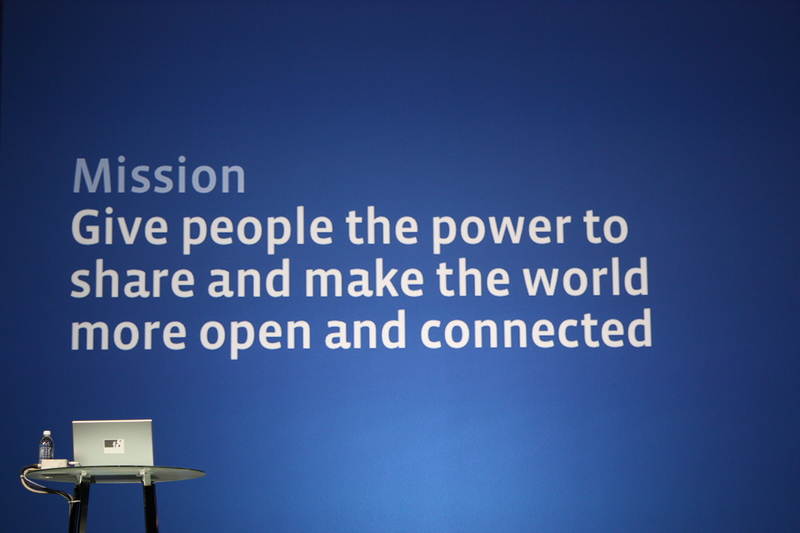 2:17 PM: Digg is now allowing people to sign into Digg via Facebook or OpenID. There is no requirement to sign up for a Digg account. 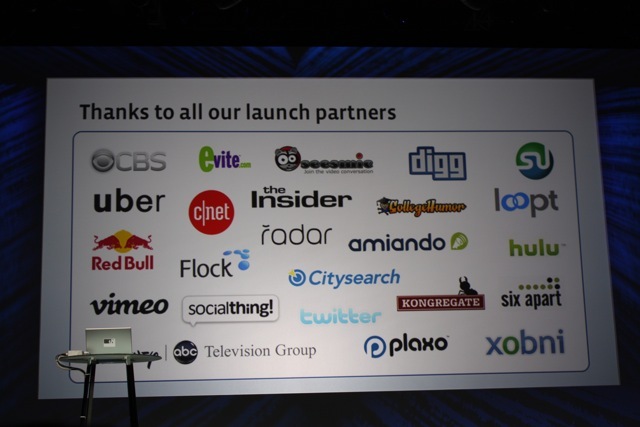 2:15 PM: Launch partners are now coming on stage. First up is Digg by Joe Stump. 2:13 PM: Facebook Connect can show you which of your Facebook friends are also on the outside service, so you can link up with them there too. 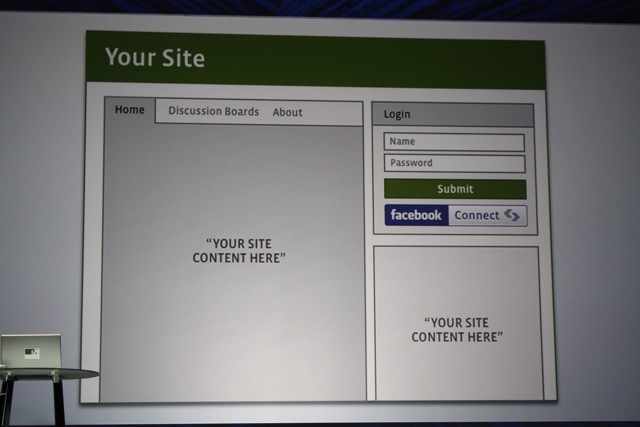 They are also allowing people to leave comments and requests on third party sites. 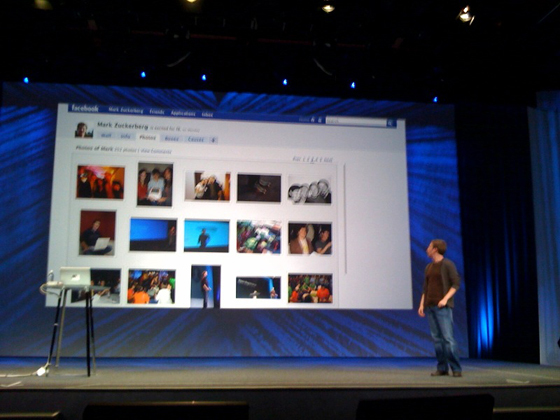 2:12 PM: Facebook Connect will let applications share data with Facebook. 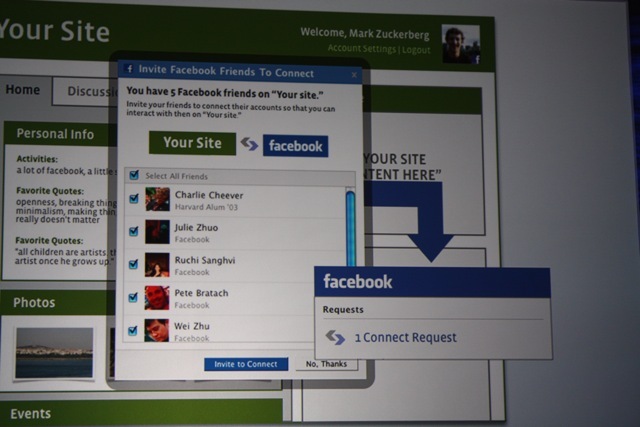 Users can bring Facebook friends with them to outside sites. 2:11 PM: Mark is now talking about Facebook Connect. 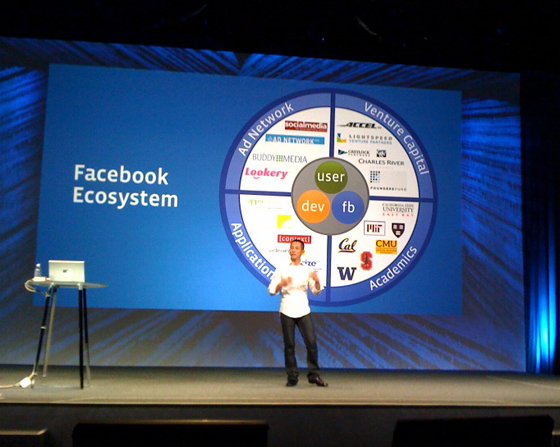 2:10 PM: He says he wants Facebook to be the platform and tools provider, but let apps do anything social they want. 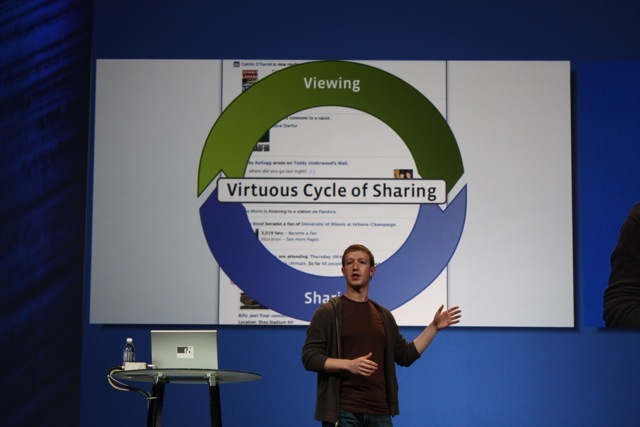 2:08 PM: Mark says we are going to see the decentralization of social networking into apps on the web. Things will decentralize further, apps can run anywhere on the web, not just on social network platforms. They will all work together, just be decentralized. 2:05 PM: People (including us) are writing wall posts for Mark since he has his profile live on stage, but it looks like he’s actually using a fake profile, it shows just 8 friends. 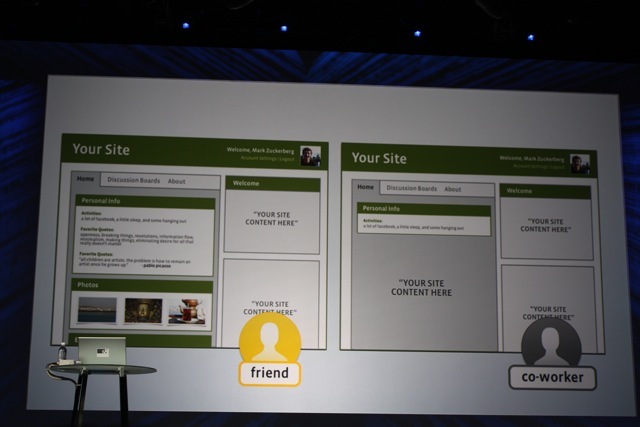 2:03 PM: Mark is now showing a live demo of the new home page. 2:02 PM: Mark says they haven’t completely gotten rid of app boxes, they’re added a tab for them. Some apps really need them. Users can also add tabs for individual apps. 1:59 PM: He says the apps that leverage the news feed the best will be the ones that succeed. 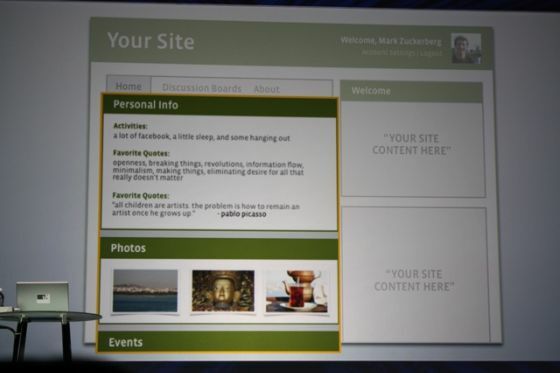 1:56 PM: Mark is now talking about the new profile pages and how it fits in with their current goals. 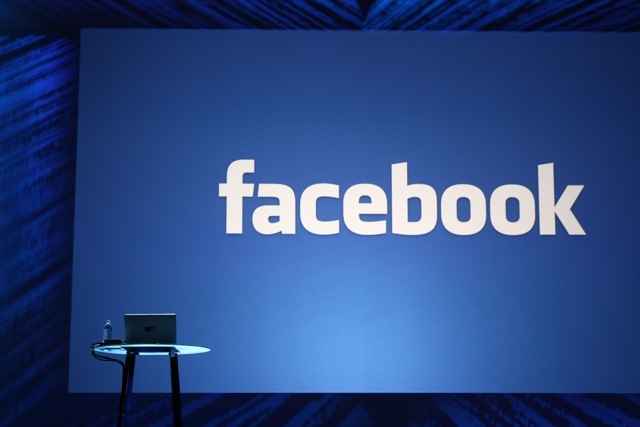 1:54 PM: Mark says that over the last year Facebook hasn’t done enough to reward applications that provide a lot of long term value, and they haven’t punished the ones abusing the system. 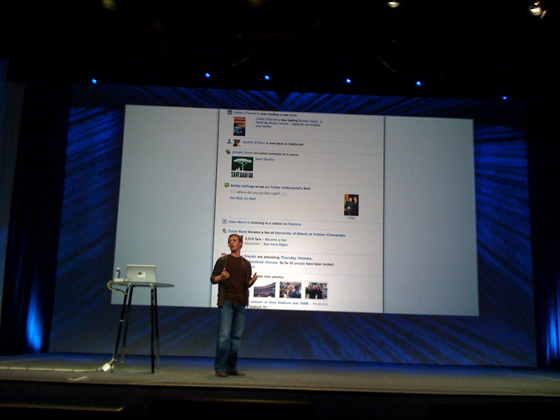 1:53 PM: Mark is talking about lessons Facebook has learned. He says that they released the platform as quickly as possible, it wasn’t fully baked yet, and they didn’t anticipate the huge adoption. 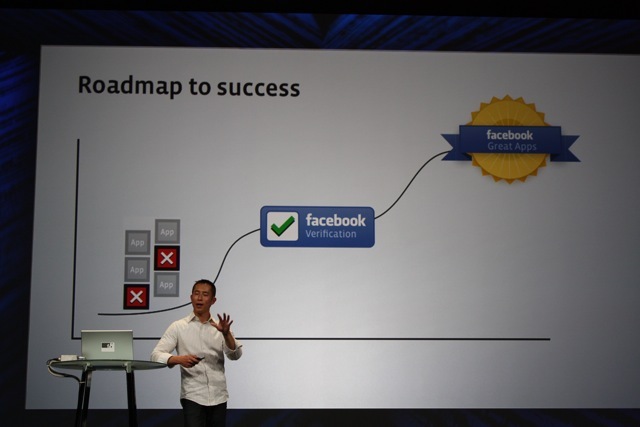 1:52 PM: Mark says the most powerful tool on Facebook today is the News Feed. 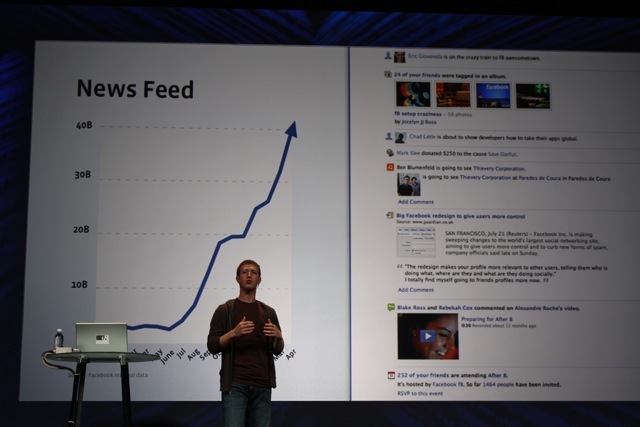 Traffic went up by 50% when they first launched news feed in late 2006. 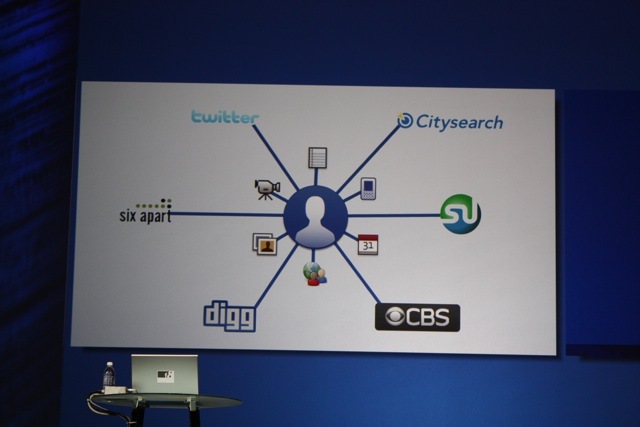 1:51 PM: Mark is now talking about the social graph, a concept he introduced at the first f8 conference. 1:47 PM: David Glazer (Director of Engineering, Friend Connect) is here in the audience (which is about 1500 people), it looks like he will announce something. Perhaps they are announcing some kind of agreement. 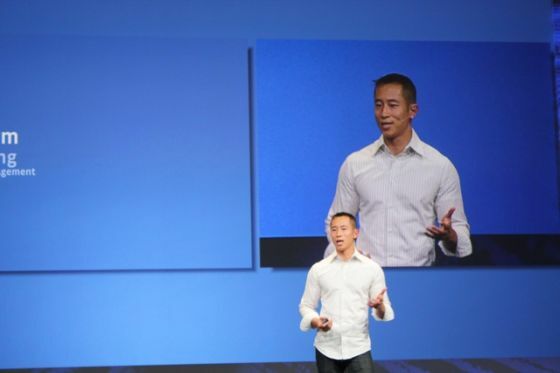 1:45 PM: “We’re opening up the translation tool to allow apps to be translated as well…We now have more than 400k developers building on top of the platform. 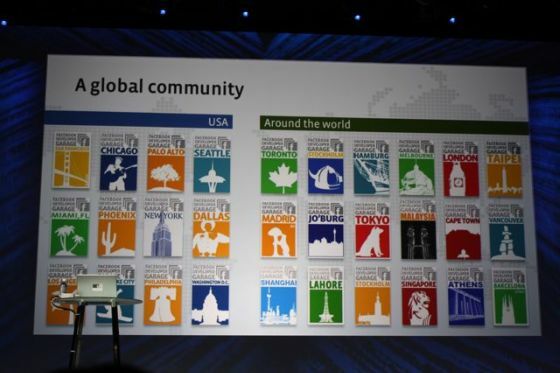 The developer community is spread around the world. More than half are outside of the US. 1:43 PM: Mark is now talking about opening up Facebook for translations made by users. They started with Spanish and French, and now the site is available in over 60 languages. 1:41 PM: Mark is looking back over the last year and says it’s been pretty crazy. 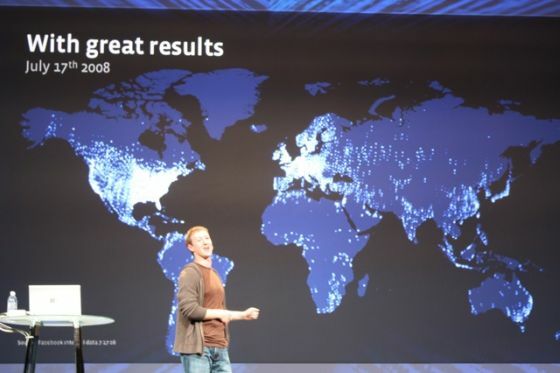 Over 24 million people were using Facebook a year ago – today they are at 90 million people. 1:35 PM: Mark takes the stage and welcomes the crowd. 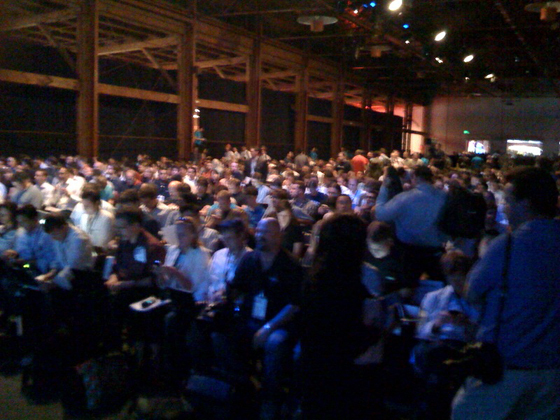 1:30 PM: Still waiting for Mark Zuckerberg to take the stage.